Wifey Nadia and I have always made a habit of celebrating Valentines Day out. If it was a time when we had some extra cash, we’d splurge, if not … we’ll, we’d still splurge, just with the credit card, lol. For the first year in our five years together, we decided to stay in. She hung out and I put together the first meal of our aphrodisiac-based menu. Check out Week 14, Meal 1: Tarragon-crusted ahi over roasted beets with tangerine, beet greens, orange vinaigrette and blood orange yogurt. The first thing you’ll need to do is roast the beets. 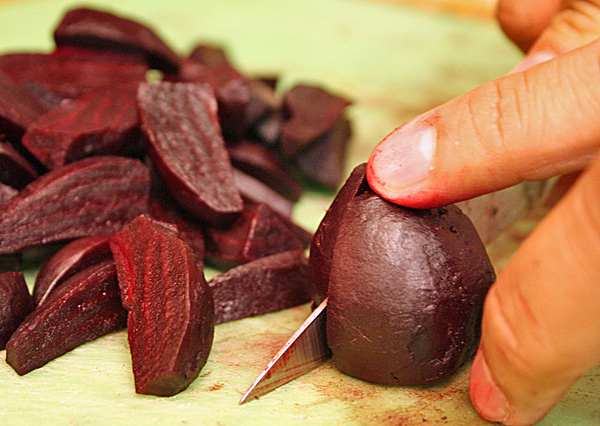 This should be done the day before you make the meal, so the beets have time to cool. It can be done the day of, but plan enough time for them to roast for up to 90 minutes and then cool. 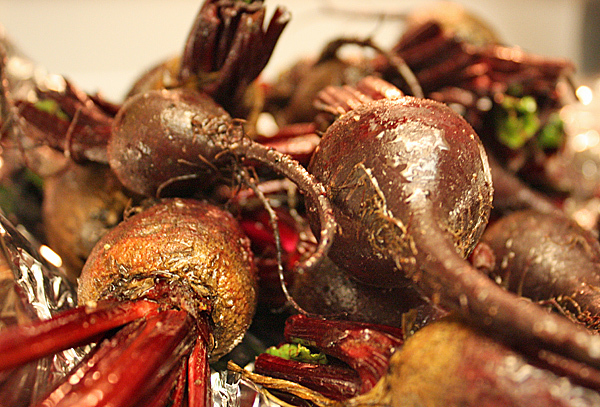 To get started, preheat the oven to 400 F. Removing the greens from 2 large or 12 baby (very small) beets. Gently wash the greens and the beets. Reserve 1 cup of beet greens and toss the beets with 2 t of olive oil. Place beets in a baking dish, with a rack preferably, and a little water in the bottom of the dish, nearly touching the rack. 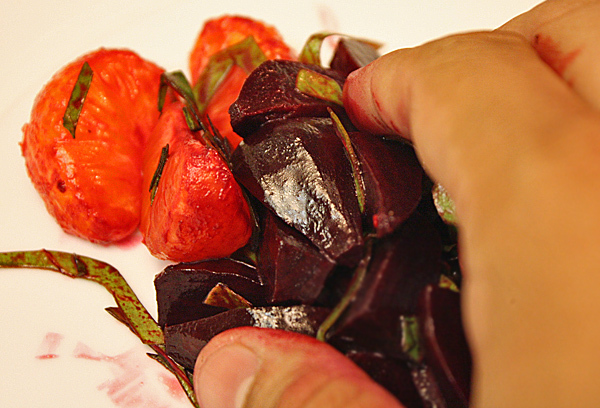 Cover the pan with foil and roast until it’s easy to pierce a beet, anywhere from 30-90 minutes depending on size. I did prep the day before, so right after putting the beets in the oven I also segmented 4 tangerines. You should also wash the grit from the beet greens and cut the stems out of them (so you only have the leaves, similar to kale). I stored the beets in the fridge overnight so they were ready to go when I was ready to cook. I removed the skin from the beets using a paper towel. If they’re properly roasted, the skin shouldn’t be too hard to rub off, though some force will be necessary. 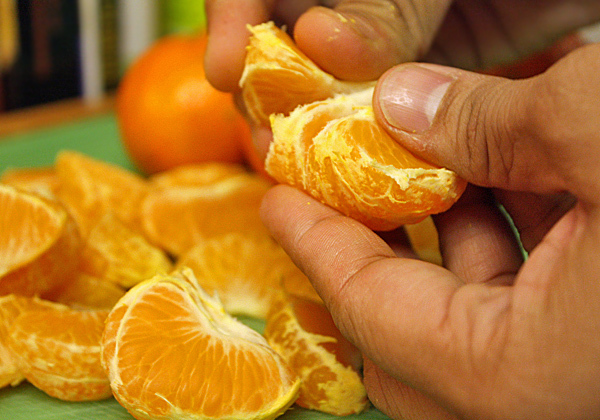 Next, cut the beets close to the size of the tangerine segments. 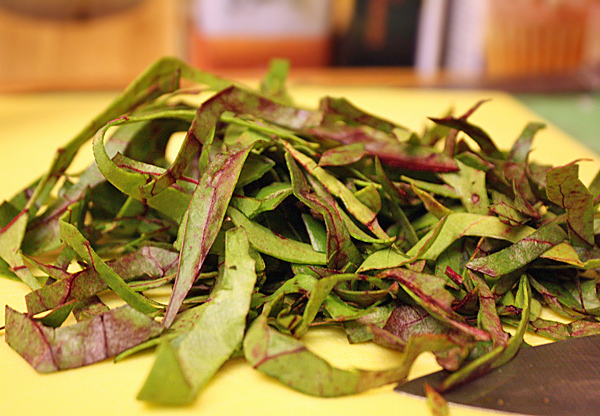 Roll up the beet leaves and then slice them lengthwise, so they unravel into strips. While you’re at the cutting board, chop up 2 T of tarragon. You’ll want to let the salad soak in the vinaigrette for about 10 minutes before plating. To make the orange vinaigrette, vigorously mix 2 t of frozen orange juice concentrate, 1 t of water, 2 t of champagne vinegar and 1 T of olive oil (doing it in a small plastic container makes this easy). Combine the tangerine, beets and greens with the vinaigrette and let the flavors marry. Juice 2 blood oranges and combine with 5 oz. of Greek yogurt and salt and pepper, to taste. Sear for 30 seconds on each side. Let rest for a couple of minutes, then cut into thin slices. To plate: Put down in a narrow row across the plate half of the beet and tangerine salad. 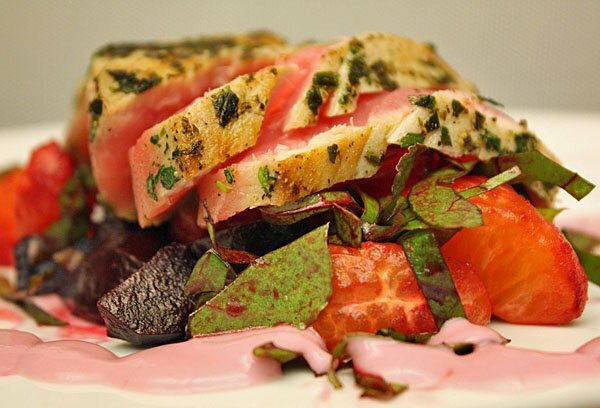 Drizzle the blood orange yogurt around the plate and then top the beets with the medium rare tuna showing as much pink as possible. (“Then get laid,” Chef Brian said. Actually, that’s the last step for all three of the recipes this week). As for taste, this recipe is crazy. The tart tangerines complement the slightly sweet, very earthy beets. 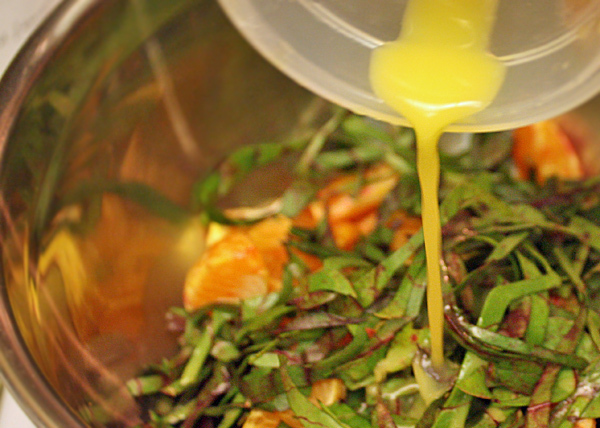 The vinaigrette brightens it all up, while the greens add slight crunch. 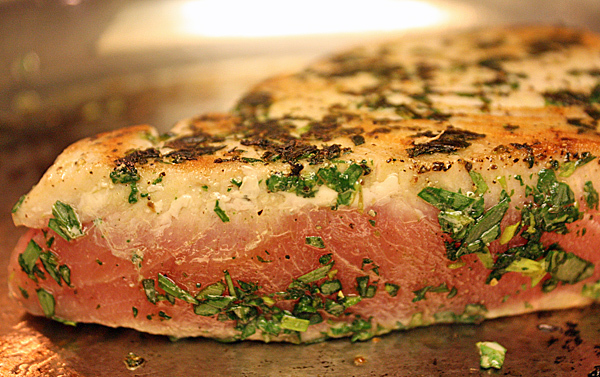 The tarragon lends a grassy, anise flavor to the dish, and the tuna provides each bite with texture to contrast the salad. 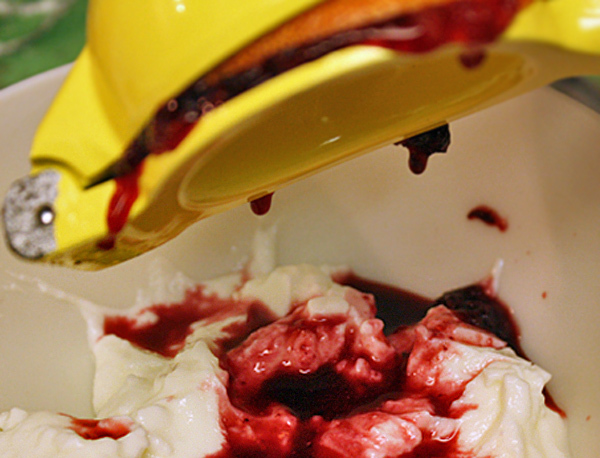 – Remove the greens from the beets. In a bowl toss the beets with the oil, salt, and pepper.